Home » Hot Copy » End of the mug shot? End of the mug shot? 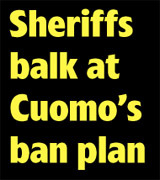 Governor Andrew Cuomo plans legislation to ban police release of mug shots and arrest information as an “unwanted invasion of personal privacy,” the Albany Times-Union Brendan Lyons reports. The Jan. 18 story quoted a Cuomo spokesman as saying the proposed amendment to Freedom of Information law is meant to combat websites that post arrest information and photos online and then try to have those arrested pay them to have the information removed. We asked local sheriffs’ views. Washington County Sheriff Jeff Murphy said the proposal “just seems to be in line with a lot of other things the Governor has proposed that seem to benefit criminals and felons. “We fully understand someone charged with a crime is innocent until proven guilty, but as police officers, we feel a duty to notify the public and be transparent and let people know when we do make an arrest. “We’ve had to arrest people who work for us, and we posted those photos. We place our recent arrests on social media, and we post mugshots and the charges. Sheriff Murphy added, “It’s important for law enforcement to show the public what they do. People have a right to know that information.